What About Collecting Sales Tax? How Do I Renew A State Business License? Where Do I Purchase My State Business License? The State of Alabama requires all persons, firms, and corporations that engage in or carry on any business or do any act for which a license is required by law, that he, she, they, or it, except as otherwise provided, shall pay to the county in which it is proposed to engage in or carry on such business or do such act, the amount required for such license and shall comply with all the other requirements of this title per Section 40-12-2 of the Code of Alabama (1975). The Tuscaloosa County License Commissioner’s Office is charged with the issuance of State Business Licenses. If you plan to conduct business within the city limits of Tuscaloosa or Northport or within the town limits of Coaling, you may be required to obtain a municipal (city) business license as well. Please contact the appropriate municipality for additional information. The Chamber of Commerce of West Alabama also has a website on starting and running a business, http://www.youronestopcenter.com. State Business License fees are determined by the exact nature and type of business being conducted. 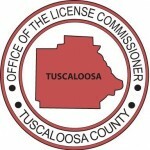 For more specific information pertaining to business license costs visit the Department of Revenue’s website at https://www.revenue.alabama.gov/licenses/index.html, or contact the Business License Manager of the Tuscaloosa County License Office at BusinessLicense@tuscco.com. Prior to issuance, some licenses require state regulatory permits, for example auto dealers, food establishments, etc. For a new business or a new location of an existing business, you must visit or contact the Tuscaloosa County License Office at 2501 7th Street, Suite 100, Tuscaloosa, AL, by email BusinessLicense@tuscco.com or telephone (205)464-8235, to purchase or update your State Business License. Be prepared to give a detailed description of the type of business you will be conducting, because this will determine the type of licenses required. All persons or businesses that sell tangible property at retail, or operate machines or places of entertainment or amusement must collect sales tax and make reports and payments to all taxing agencies. For more information on collecting sales tax, contact the Tuscaloosa County Special Tax Board. State Business Licenses are valid for a fiscal year beginning October 1, and ending September 30 of the following year. Business licenses are renewed yearly between October 1st and October 31st. Reminder notices to renew are sent out, but are only done so as a courtesy. Alabama law mandates penalties for failure to renew a business license during the specified renewal period. State Business License renewals can be processed by mail for an additional $2 mail fee. If your business changes location, your original business license must be updated. Bring your current State Business License to the main office of the Tuscaloosa County License Office in the Courthouse Annex at 2501 7th Street, Tuscaloosa, or contact us by email BusinessLicense@tuscco.com or telephone (205) 464-8235 in order to change the address on your State Business License to the new location. Auto dealers must contact the Alabama Department of Revenue, Motor Vehicle Division – Dealer License Section for procedures to change the location of the dealership. The Dealer License Section can be contacted by email at dealerlicense@revenue.alabama.gov or by phone at (334) 242-9007. State Business Licenses may be transferred to new owners. Bring the original State Business License and the transfer of ownership documents to the Main License Office or contact us in order to transfer the State Business License. NOTE: State Business Licenses issued to professionals (doctors, engineers, accountants, manicurists, etc.) are NOT transferable. State Business Licenses for Tuscaloosa County can only be purchased at the Main Office, and CANNOT be purchased at our satellite locations. You may contact us by email at BusinessLicense@tuscco.com or by calling us at (205) 464-8235 for information on how to purchase a license. If you have any questions about business licenses, email us at BusinessLicense@tuscco.com or call us at (205) 464-8235.